The legitimacy of Congolese President Felix Tshisekedi is being tested following the failure of his party to win a single Senate seat, and the decision by the US to impose sanctions on electoral officials who presided over his victory. On March 22, the US Department of the Treasury's Office of Foreign Assets Control imposed sanctions on three senior officials of the Independent National Electoral Commission (Ceni) due to alleged corrupt deals made behind the scenes. The three are the electoral body's president Corneille Nangaa, vice-president Norbert Basengezi Katintima, and Mr Katintima's son, Marcellin Mukolo, a high-level Ceni advisor. Sarah Gardiner, an investigative analyst at The Sentry, said the sanctions are an important step in ensuring accountability for electoral fraud during Congo's presidential election in December last year. "The new US sanctions are a step in the right direction, but if the US is going to have an impact on systemic corruption in Congo, much more extensive financial pressure on corrupt actors is needed," she said. The sanctions require blocking of the designated persons' assets within US jurisdiction, and US persons are prohibited from engaging in transactions with them. Sasha Lezhnev, deputy director of policy at the Enough Project, said targeted sanctions, anti-money laundering measures and prosecutions against inner network of the former president Joseph Kabila's financial facilitators, and their networks of companies will be critical to create the political space needed for anti-corruption reforms that Congolese civil society is pushing for. "Former president Kabila has formally left office, but it is clear that he and his inner circle still hold the keys to power," said Mr Lezhnev. Martin Fayulu of the Lamuaka Coalition--who came in second in the presidential elections--has maintained that he was robbed of his victory as a result of a behind-the-scenes deal between Tshisekedi and Kabila, with the help of Ceni. The fact that Mr Kabila still wields immense powers emerged late last week, when President Tshisekedi's Union for Democracy and Social Progress (UDPS) failed to win a seat in the 100-seat Senate in which Kabila's Common Front for the Congo (FCC) won more than 90. The Senate was elected by the 24 provincial assemblies and there were complaints that UDPS deputies were bribed to vote for FCC candidates. President Tshisekedi responded by stopping the inauguration of the senators citing electoral malpractices and corruption. He also stopped the elections for governors, resulting in a public exchange of words between UDPS and FCC. The public FCC reminder to President Tshisekedi on how he came to power is an admission that there was a behind-the-scene deal. 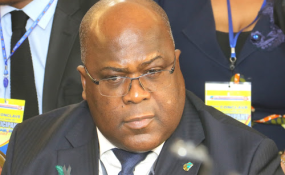 There have been concerns that President Tshisekedi has delayed forming his Cabinet and naming the prime minister since he was sworn in on January 24. This is attributed to behind-the-scenes horse-trading between Tshisekedi's CACH Coalition and FCC over who gets what portfolio.